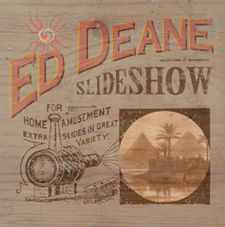 All music by Ed Deane except Palm Tree Strut (Ed Deane/ Martin Hughes) and There’s a Man Goin’ Round (Traditional/arr. Ed Deane). Recorded in Dublin, London and Portugal. Mixed and mastered in Dublin, November 2005 to January 2006, at The Soundworks. Ed Deane; electric & slide guitar, national steel guitar, lap steel guitar, baritone guitar, acoustic guitar, saz, bass, organ. Martin Hughes; drums & drum programming. Charlie Hart; kalimba, percussion and keyboards. Produced by Ed Deane and Brendan Foreman. Ed Deane is one of the forgotten figures of the early Irish rock scene. I can still see him, long hair falling over his eyes, as, left-handed, he played his right-handed guitar upside-down with Blueshouse. It was an amazing sight, but no less amazing than the sounds he made, particularly when playing slide guitar. He loved the blues, but it has taken him well over 30 years to finally make an album of his own after a lifetime playing for others. It is typically low-key. There is nothing showy about his playing, but the 12 instrumental tracks display his craft, the sureness of his touch and the breadth of his influences. The blues are there, of course, but there are also nods to country and rock ‘n’ roll in a selection of tunes spiced with humour and attitude, eg Surfin with the Mummy, and on which he gets great support from old friend Eamon Murray on sax and harmonica. First solo album from acclaimed Irish session guitarist features a wealth of moods and styles, from excellent surf and film noir parodies to atmospheric blues and more impressionistic pieces. An impressive showcase for a very accomplished musician. In over thirty years of making a living as a musician, Irish guitarist Ed Deane has been a member of so many different groups, he’s probably forgotten half of them himself. On his instrumental album Slideshow, Ed revels in playing a different style on each tune, and comes up with a moment of magic in the one he calls Way Out East. The first haunting notes of this album, wistfully bleeding forth from the eerily toned slide guitar on the opening track, Love The Way You Do, are enough to perk the ears and make one’s neck hair stand straight up. This collection of instrumental blues springboards from there, exploring variances in style but maintaining a deep resonance that continuously nods to traditional blues playing at its best. These songs aren’t showy, overly complex or demanding of any fanciful trickery that could only muck up the purity of the form. What they are, and wisely so, are songs of structure and understated depth that are as timeless as they are intelligent. Even a song like Surfin’ With The Mummy, a keyboard-driven surf number that feels slightly tongue-in-cheek, is delivered with such sincere attention to detail that it is clearly based more in homage than parody. It’s one of the many genre-bending surprises that makes this such an easily digestible collection. Each song is unexpected, incorporating different elements from the next, but their common bond is that they’re equally adept at creating and maintaining a tangible mood that is both entertaining and, when it comes to the musicianship, very impressive.